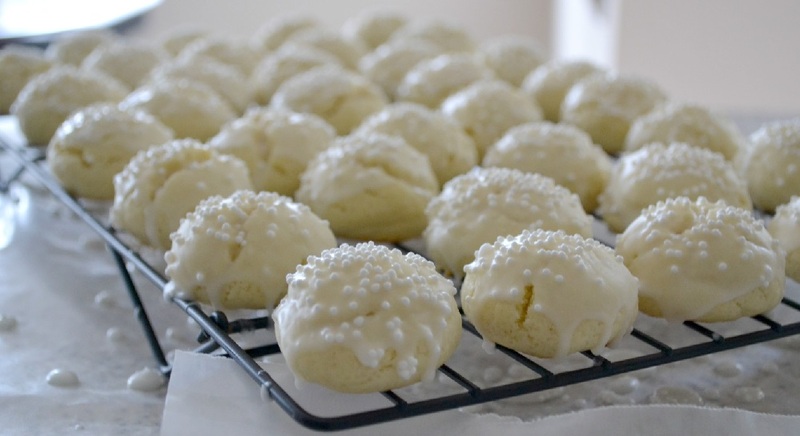 Anisette Cookies: Anisette cookies are one of those very traditional Italian cookie recipes. This cookie gets it’s flavoring from the anise extract. And if you aren’t familiar with anise – the closest thing it taste like is black licorice (Even though licorice isn’t a part of the ingredient). In a small saucepan, melt the butter and shortening over low heat. Remove the butter and shortening mixture from heat. Add the melted butter – shortening mixture to the bowl of your stand mixer. Mix until combined, ittakes about 30 seconds. Add each egg, one at a time, until they are incorporated. Add the anise extract (or vanilla; or lemon) to the mixture. In half cup increments, add the dry ingredients into the wet mixture. Mix to combine until a soft dough forms. The dough will be soft, but still manageable. Note: If the dough isn’t manageable (where you can work it into a teaspoon-sized ball without making a mess), add a tablespoons (one at a time) of flour until you reach this consistency. Roll the dough into 3/4 – 1 inch balls. Place the balls on your baking sheet, spacing them at least 1 inch apart. Bake the dough balls at 375 degrees F for 7-8 minutes until they just begin to brown on the bottoms and just begin to crack slightly on top. Remove from oven and transfer to a wire rack to cool completely. Repeat this step for the rest of your dough. While your cookies are cooling, prepare the glaze. In a bowl, whisk together the confectioner’s sugar, anise extract (or vanilla; or lemon) and half and half. Make the glaze on the heavier side. Dip the top of each cookie in the glaze. Place the glazed cookies back on the wire rack to set. Decorate anisette cookies with sprinkles or sugar immediately before the glaze hardens. Anisette Cookies are ready to be served. Anisette Cookies can be stored for a week or two in an airtight container.